These uniform insignia were worn by cockpit crewmembers from 1961 to 1980. The manufacturer was V. H. Blackinton & Co., Attleboro, MA. The cap emblem was worn by all cockpit crewmembers. It is 2 1/4" wide, with a screw back. The wings are 3 1/4" wide, with a clutch back. 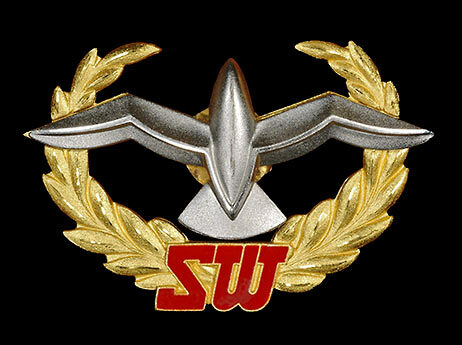 The top wing, with the star, was worn by captains. The lower wing was worn by copilots, flight engineers, and navigators.